In addition to the fenders I painted for the show, I exhibited this bike at the Fine Fendered Friends show. It is available for purchase through Good Wheel Bicycles. 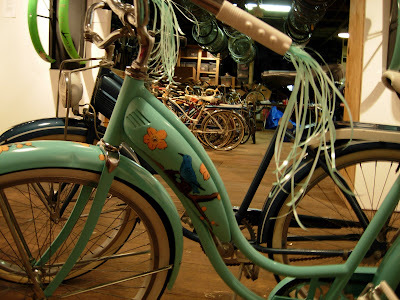 Hi, I am a girl-bike-lover as well, and I just got this old 50's cruiser I want to restore. My question for you is, what sort of paint did you use to paint that cute bird? BTW, you are very talented and I am so excited that there is someone else in MPLS that loves, loves, loves 1. to be girly, 2. to ride bikes, 3. loves to paint, and 4. can put all those together.